Clinton, Sanders and O’Malley wrangle over rhetoric and revolution. The second Democratic presidential debate in Iowa highlighted substantial gaps in foreign policy knowledge and experience among candidates Hillary Clinton, Bernie Sanders and Martin O’Malley. Just 24 hours after the terrorist attacks in Paris, the debate underscored, more than ever, the critical importance of presidential leadership. Terrorism and the Middle East predictably dominated the first half hour of the debate. Specific discussion of the U.S. rebalance policy toward Asia was conspicuously absent – surprising given Clinton’s role as its chief champion. Although Clinton emerged to hold onto her heavyweight status as frontrunner and presumptive nominee, debate rivals amplified vulnerabilities in her foreign policy agenda as well as her positions on gun control, minimum wage reform and regulation of Wall Street. We pose the same six questions on the implications of this second Democratic debate as we did in the fourth GOP debate last week assessing candidates’ substance, style and stamina. Although the three candidates agreed on deploying multilateral efforts against terrorism, they offered incomplete visions of how to defeat Islamic State. 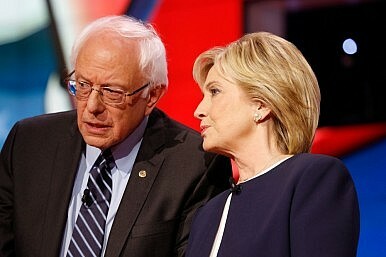 When asked if the United States is at war with radical Islam, the candidates avoided reference to Islam, opting instead for their own labels – “we’re at war with jihadists, barbarism and nihilism” (Clinton); “the term ‘radical Islam’ is not important (Sanders); and “radical jihadi” (O’Malley). Candidates’ inability to name the enemy raises questions about their ability to discern the source and scale of the threat. Clinton mentioned China in a five-second reference at the end of the foreign policy segment, “We’ve got challenges in the South China Sea because of what China is doing in building up these military installations.” Clinton’s lack of clarity on the administration’s recent Freedom of Navigation (FON) exercises in the South China Sea and on opting for continued diplomacy with China reinforced her default mode of political ambiguity. The absence of any reference to cyber security threats was a glaring gap. Though Clinton acknowledged China and Russia as geopolitical challenges for the United States, she missed an opportunity to segue from combating global terrorism into engaging China, India and Russia to defeat Islamic jihadist threats across Asia. Departing from the first Democratic debate, candidates on Saturday opted not to address the Obama administration’s policy pivot to Asia and its cornerstone economic component, the Trans-Pacific Partnership (TPP) trade agreement. The current delay in its legislative review highly compromises its passage while most Americans agree that the TPP benefits the United States. As President Barack Obama participates in the Asia-Pacific Economic Cooperation (APEC) summit in the Philippines this week, the candidates’ omission of TPP discussion projects little reassurance of U.S. intentions to bolster strategic engagement in the region. Candidates stayed on message for much of the debate. Lapses in their rebuttals to controversial issues, however, accentuated each candidate’s weaknesses. Clinton attacked to the GOP to deflect doubt surrounding her judgment in the email server controversy. Sanders circumvented geopolitical reality by applying his panacea of “political revolution” to all policy challenges from terrorism to income inequality. O’Malley played up his executive management skills to compensate for lack of foreign policy savvy and time-tested crisis leadership experience. With the first caucuses and primaries quickly approaching, Clinton will face increased scrutiny by her nomination rivals and the Republican field of contenders. Clinton is expected to further clarify her policy flip-flops including the TPP and the larger picture of whether she would sustain or recalibrate U.S. rebalance to Asia. All presidential candidates will enrich future debates and enhance the electoral process by cutting through the rhetoric and explaining the reality of how Asia’s geopolitical landscape impacts U.S. vital interests.